Cell migration is an integral part of several biological processes including angiogenesis, wound healing, and immune surveillance1. Integrins are αβ heterodimeric transmembrane receptors that link a cell’s dynamic interactions with the extracellular matrix (ECM) to the cytoskeletal rearrangements that are necessary to promote cell motility (Fig. 1). The ECM proteins that are engaged by integrins include fibronectin, collagen, and laminin; multiple integrins exist with varying affinities for each ECM protein (e.g., nine different integrin isoforms can bind fibronectin)2. Consequently, cell adhesion dynamics and motility are influenced by the repertoire of integrins employed by a cell2, and changes in the profile of expressed integrins in various cancers have been linked to increased invasive behavior and metastasis3,4. The transduction of integrin receptor signals to the actin cytoskeleton is a complex and multifaceted process (Fig. 1). Integrin receptors cluster upon engaging the ECM and transmit signals to actin through multiple means, including bridging proteins (e.g., talin, vinculin and α-actinin), the recruitment of the Arp2/3 complex, and activation of kinases (e.g., FAK, ILK, etc.) and small G-proteins (e.g., Rho GTPases)1. Integrin engagement also leads to the production of reactive oxygen species (ROS) by varied means (e.g., NADPH oxidase, 5-lipoxygenase, and mitochondria5), which can result in actin oxidation. Of the six conserved cysteine residues that are present in β-actin, only Cys374 is both redox-sensitive and accessible in both the globular (monomeric) and filamentous (polymeric) forms of actin (i.e., G-actin and F-actin, respectively)6-8. Oxidation of β-actin is necessary for cell spreading in response to integrin engagement with fibronectin and has been shown to occur via the formation of a mixed disulfide bond between Cys374 and glutathione in a reversible process known as S-glutathionylation9. This modification actually serves a dual purpose in that it protects actin from irreversible oxidation and it provides a signal for downstream events. One of the important consequences of β-actin S-glutathionylation is the disassembly of the actomyosin complex (i.e., F-actin and myosin), which is a necessary step for successful cell adhesion and migration9 (Fig. 1). Fig. 1: Impact of integrin receptor interactions with the ECM on actin dynamics. 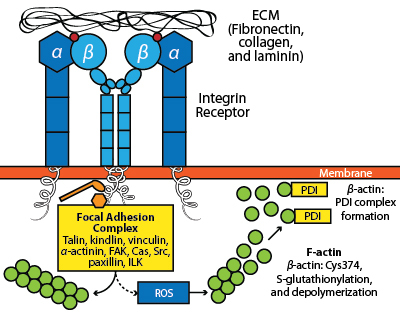 The engagement of the integrin receptor with ECM proteins (e.g., fibronectin, collagen, or laminin) leads to receptor clustering, focal adhesion complex formation and the stimulation of local actin polymerization. In contrast, downstream signaling leads to the production of ROS that promotes β-actin Cys374 oxidation, resulting in S-glutathionylation of this residue and the association of β-actin with PDI, a step that is essential for cell motility. The reversal of S-glutathionylation can occur in both an enzyme-dependent and independent manner7,10. The primary enzyme responsible for this process is thought to be glutaredoxin, although thioredoxin, sulfiredoxin, and protein disulfide isomerase (PDI) can also perform this function7,11. PDI has a canonical role in the formation of correct disulfide bonds in nascent proteins in the endoplasmic reticulum (ER)12; however, PDI also functions extracellularly in platelet aggregation13,14 and has been shown to be released from the ER in a signal-dependent manner15. Recent evidence suggests that PDI has a major role in the regulation of β-actin oxidation in response to αIIbβ3 integrin engagement by fibronectin16. In this study by Sobierajska et al16, PDI was shown to form a mixed disulfide bond with β-actin Cys374 under conditions of integrin activation (Fig. 1). Consistent with this role for PDI residing outside of the ER, immunofluorescence experiments demonstrated that PDI and β-actin colocalize in membrane protrusions (i.e., lamellipodia) associated with cell spreading. The physiological relevance of the β-actin:PDI complex was also demonstrated using antisense RNA to PDI, where the downregulation of PDI expression resulted in impaired cell adhesion and spreading on fibronectin. 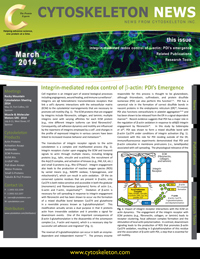 The finding that PDI has an important role in regulating the oxidation of β-actin in response to integrin signaling suggests it may be important in other signal transduction pathways where β-actin is S-glutathionylated. Furthermore, it will fascinating to see if further research in this area reveals a broader role for PDI in regulating other S-glutathionylated proteins, and whether PDI-linked proteins will show promise as biomarkers of disease. At Cytoskeleton, we offer a variety of actin-based tools to help the researcher study redox regulation of β-actin. Products include purified β-actin (non-muscle; unlabeled and rhodamine-labeled) actin polymerization assay kits, G-/F-actin in vivo assay kits, assorted actin binding proteins (e.g., α-actinin, Arp2/3 complex), and antibodies. In addition, we offer custom-produced proteins and assays along with compound screening. For more information on these products and services or if you have questions about redox regulation of actin, please send an email to Cytoskeleton’s Technical Support Team (tservice@cytoskeleton.com). Srichai M.B. and Zent R. 2010. Integrin structure and function. In: Cell-Extracellular Matrix Interactions in Cancer, R. Zent and A. Pozzi, Eds., pp. 19–41, Springer Science+Business Media, LLC., New York, NY. Huttenlocher A. and Horwitz A.R. 2011. Integrins in Cell Migration. Cold Spring Harb. Perspect. Biol. 3, a005074. Seftor R.E.B. et al. 1992. Role of avb3 integrin in human melanoma cell invasion. Proc. Natl. Acad. Sci. U.S.A. 89, 1557-1561. Chan B.M.C. et al. 1990. In vitro and in vivo consequences of VLA-1 expression on rhabdomyosarcoma cells. Science. 251, 1600-1602. Zeller K.S. et al. 2013. The role of mechanical force and ROS in integrin-dependent signals. PLoS ONE. 8, e64897. Stournaras C. 1990. Exposure of thiol groups and bound nucleotide in G-actin: thiols as an indicator for the native state of actin. Anti-Cancer Res. 10, 1651-1659. Dalle-Donne I. et al. 2003. Reversible S-glutathionylation of C374 regulates actin filament formation by inducing structural changes in the actin molecule. Free Radic. Biol. Med. 34, 23-32. Orlova A. et al. 2001. Probing the structure of F-actin: cross-links constrain atomic models and modify actin dynamics. J. Mol. Biol. 312, 95-106. Fiaschi T. et al. 2006. Redox regulation of beta-actin during integrin-mediated cell adhesion. J. Biol. Chem. 281, 22983–22991. Grek C.L. et al. 2013. Causes and consequences of cysteine S-glutathionylation. J. Biol. Chem. 288, 26497-26504. Reinhardt C. et al. 2008. Protein disulfide isomerase acts as an injury response signal that enhances fibrin generation via tissue factor activation. J. Clin. Invest. 118, 1110-1122. Noiva R. 1999. Protein disulfide isomerase: The multifunctional redox chaperone of the endoplasmic reticulum. Semin. Cell Dev. Biol. 10, 481-493. Essex D.W. and Li M. 2003. Redox control of platelet aggregation. Biochemistry. 42, 129-136. Jasuja R. et al. 2010. Endothelium-derived but not platelet-derived protein disulfide isomerase is required for thrombus formation in vivo. Blood. 116, 4665-4674. Safran M. et al. 1992. Thyroid hormone-dependent redistribution of the 55-kilodalton monomer of protein disulfide isomerase in cultured glial cells. Endocrinology. 131, 2413-2418. Sobierajska K. et al. 2014. PDI directly interacts with b-actin Cys374 and regulates cytoskeleton reorganization. J. Biol. Chem. doi: 10.1074/jbc.M113.479477.